Plunge into a world of mysticism, horror and science-fiction. Listen to this first part of the trilogy called « Rise of the Cursed Son » and discover an innovative album which opens the era of a new style: the Dark Metal Opera. It does not resemble famous concept albums such as Avantasia, Star One or WASP’s amazing Crimson Idol. It finds its place between RHAPSODY and DIMMU BORGIR, BLIND GUARDIAN and THERION. All the lyrics are dialogue between characters and each voice depicts one character. 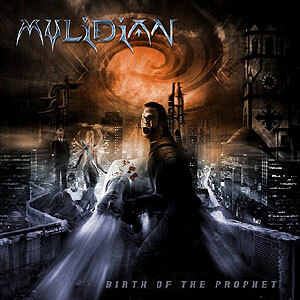 The quality of this first opus competes with the greatest productions: production by Didier Chesneau (Headline, Evergrey, Vanden Plas, In Victus, Iron Mask, Magic Kingdom...), artwork by Mattias Norén (Stratovarius, Evergrey, Kamelot, Kotipelto, Star One...), mastering at Top Master (Universal, Polygram, NTS, Holy Records...), and symphonic orchestrations with a choir of fifty voices. But the Mylidian concept is not only a simple album. A role playing game with characters evolving in this universe is being developed and is supposed to be released in 2007.